When it comes to Internet Browsers such as the Internet Explorer, rarely would you consider them having any impact as far as the business aspect of things is concerned. But apparently, that is one additional highlight that Microsoft aims to cater to as it has announced better performance, easier Web development tools for enhanced browser experiences and improved security and reliability. Dean Hachamovitch, general manager of the Internet Explorer team at Microsoft, showcased solutions from industry partners such as ESPN, eBay Inc., Digg Inc., Facebook and OneRiot that create new value for their customers. “With the Internet Explorer 8 platform, Microsoft creates opportunities for Web sites to engage customers in new ways and drive not only more traffic, but also more value in the online experience,” Hachamovitch said. Developers will benefit from performance features that enable Web sites to allow customers to engage more deeply with their site content. Accelerators and Web Slices make it easier for developers to reach beyond the page and provide new ways for people to stay connected to the content and services of their choice. 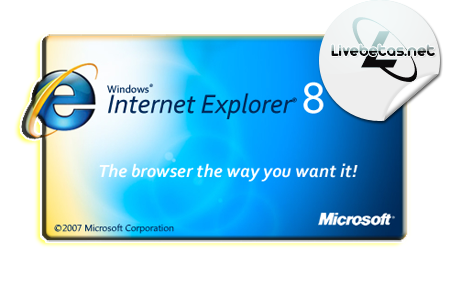 Internet Explorer 8 has enhanced search features and capabilities to provide more interesting and relevant content, increased speed, and enhanced security, and offers greater performance and reliability. 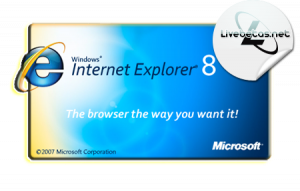 Internet Explorer 8 is Microsoft’s most standards-compliant browser to date, and benefits from work the company is doing with standards bodies to bring increased measurement and consistency. As part of Microsoft’s commitment to supporting standards, the company has submitted more than 7,000 cascading style sheet (CSS) 2.1 test cases to the World Wide Web Consortium (W3C) in the last year to help drive easier and more measurable standards adoption for all developers. Moreover, Internet Explorer 8 now passes more of the W3C CSS 2.1 test cases than any other shipping browser and has invested significantly in support for HTML 5. Defaulting to standards-mode for Web sites and featuring a Compatibility View list to ease the transition enables developers to be sure their code runs across multiple browsers and platforms, freeing developers to innovate, not re-create. First, it attacks a vulnerability in the Microsoft Server service. Computers without the October patch can be remotely attacked and taken over. Second, Conficker can attempt to guess or ‘brute force’ Administrator passwords used by local networks and spread through network shares. And third, the worm infects removable devices and network shares with an autorun file that executes as soon as a USB drive or other infected device is connected to a victim PC. Businesses are obviously the main prey considering that offices make use of networks to do their dirty work. However, home-based computers are not completely off the hook. Issues surrounding having a firewall and having properly safeguarding software can still be breached. Hence, it is all about patching the loopholes. Be careful of the gadgets you plug-in and be wary of the connections you have like accessing the web. These are the spots where it can come from and to make sure, just do the necessary so you don�t end up being infected as well. Disable the Autorun so that a PC won’t suffer automatic attack from an infected USB drive or other removable media when it’s connected. Most people who go to the office are bound to be equipped with their own PC these days and normally, these are given for work purposes. However, we cannot discount the possibility of perhaps surfing some sites or using our computers for other purposes. However, some companies are not as lenient and if you are not careful, you may just find yourself getting the pink slip and out in the cold looking for a new job. The employees in question worked in half a dozen departments from Purchasing to Public Works, WPBF News 25 reported. Human resources managers said the investigation began with a check into one employee’s e-mails and Internet history. There is no doubt that companies mean business these days. Productivity is their main focus. And finding employees simply surfing or bumming around doing non-work related things with their computer, the position may as well be open to other people who really want to buckle down and work. They have ways to check your computer. E-mails, instant messaging history and even your search history. All of these are cached and can be accessed in an instant. So if you want to avoid getting the boot, better avoid these sidelights unless you have a new job in mind. Certainly, this is not the time to lose a job especially that recession issues are increasing in numbers. Use your PC well! Education is one of the primary reasons to which computers were developed. For the aspiring student, doing their homework and doing research has never been easier considering that they can type and do computations through the various software such as MS Office installed in standard desktops. Businesses as well have benefited and has become a learning experience. Imagine doing away with the standard manual means of doing business to produce timely business reports pertinent towards overall assessment business performance. Through computers, much of the reports have become easy to produce and pinpoint should there be figures up in question. In all aspects of life, it shows that computers have surely showed the way. Children today should be happy that computers came to be during their time. Learning and enhancing their studies has opened a lot of doors as far as methods of learning is concerned. In short, a lot of time and methodologies make education these days totally advanced. There are still families without computers and while they aspire to have one, finance constraints have become an issue. But just the same, they are provided proper exposure through schools today which are normally offering computer courses and lessons to familiarize students of their use and benefits as they progress. Indeed, a computer is a child’s partner and is a good investment. All that really remains is knowing up to what extent you can invest on them. Whatever the amount would be, it is a good one considering it helps in practically all aspects of our life these days. As far as technology is concerned, it would be an understatement if we would not admit that for most, both personal and business, we have been overly reliant on computer use. Too reliant that while we find computers as a big lifesaver, we forget to go further when treating certain issues such as backups and computer maintenance. These are things that are not so hard to do. But people are either afraid to try or lazy do them. Both are really unacceptable. The fact remains that computers do not have a mind of their own. They can perform certain routines but that will not happen if they are not programmed or scheduled. In short, human intervention is still imminent. Without it, a computer will sit there and do nothing but gather dust. These days, if you want technology to work for you, you have to do your part in making it happen. A small effort will not hurt. And it is not even that complicated to do. As it stands right now, it seems that a personal computer is present anywhere we go these days. Either they are being used for business or personal use, computer technology is no longer a scarce sight where we used to see them only among the elite or from the people who know what to do with them. In homes, they are now used in lieu of the traditional typewriter and communications means using the Internet. The standard telephone units we have are taking a backseat since compared to using computer applications such as Skype, people can communicate anywhere on a broader range and at a cheaper rate. As far as word processing is concerned, the computer is the better option considering you can save paper while at the same time review on your monitor what you have composed before pushing the print icon on the usual applications that we are accustomed to using right now. For business, it is not only a word processing or spreadsheet ally. It is likewise instrumental in automating most business operations, leaving lesser rooms for human error and making the job of the worker a whole lot easier. So in the case of managers, today you can generate reports in shorter time and at presentable fashion as well. You don’t have to cram and make lives of neighboring departments harder since with computers participating in a network, programs these days have made the whole process as simple as pushing a single button. If we look at standard operational procedures, we would see most jobs and workloads relying so much on manual labor. But that was yesterday’s news. These days, we have seen the power of technology as some tasks have shown the latest injection of computers and systems to make jobs accurate and faster. This is not to say that man cannot do routine work on his own. But the real competitive leverage these days is being fast and efficient. Apparently this has become the benchmark for companies to be at par with modern companies and also a means of getting them a step ahead. In the corporate world, you cannot afford to nap and if you do, chances are you will find yourself tailing other companies that are the frontrunners for success. While the presence of a computer desktop may seem like a threat to most workers today, it should not. Computers are innovations and they are in now way present to take the place of hands-on labor. This is the wrong perception that most people put in their minds today. Rather than cooperate and enjoy the fruits of making their work easier, they make it harder by treating these fruits as banes to their livelihood. This is crab mentality that many just cannot figure out. Rather than make life easier, they take at the influx of computers and gadgets as a step towards a different direction. So rather than enjoy and even look forward to gaining additional knowledge from these technology developments, they are showing that they have resistance and may even lose the opportunity to advance in knowledge and experience. In job requirements these days, you will notice that computer literacy is a must. Perhaps people should look at this chance as working to their advantage. Practically all companies today are apprehensive on the flow of the market and for Lenovo, taking another crack at a faltering marketing in the desktop division seems to be a move that will certainly draw varied criticism on the timing of its market penetration efforts towards the desktop computing sector. Apparently, the risk is quite high. No one knows what the future of the desktop computing industry will hold. But with their fingers crossed, apparently Lenovo is banking on a turn for the better any time soon, making a move that most companies would save for later when something clearer sets forth. Lenovo which bought the PC division of IBM in 2004, has been a prominent figure in the laptop market. With its brand, its association with IBM is something that has carried it towards strides in better business. 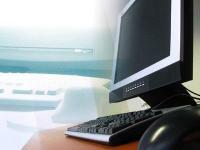 But as far as desktop computing is concerned, it can really be seen as something as starting once again from scratch. To kick off their campaign, they have introduced into the market the IdeaCentre K210 Desktop last June 30 towards the consumer desktop market outside of China. But the weird thing about it all is that while other large computer companies are shifting towards mobile solutions, Lenovo is moving towards the opposite direction. From a strategical management standpoint, you may call it catering towards the remaining customers in the desktop industry. For sure there is still a wide open market for it. But the question is on whether this investment will pay off. Perhaps Lenovo has seen something that other have not. Only time will tell if the investment risk will indeed reap dividends.